Well wishers have been flooding social media since Saturday night. Beyoncé's father, Mathew Knowles, tweeted, "They're here! #beyonce #twins #jayz #happybirthday" with a photo of balloons that said, "Happy Birthday to the twins! Love, Granddad." Fans said they want to see pictures and know the babies' gender. "#Beyonce has reportedly given birth to the twins, which means her next Instagram photo will be the greatest photo of all time," tweeted Michelle da Silva @michdas. A photo of Beyoncé accompanying her February announcement, in which she was surrounded by flowers and draped in sheer material, spurred both excitement and parody. It also broke records for the most-liked photo on Instagram. Beyoncé adjusted her performance schedule after sharing her pregnancy news. 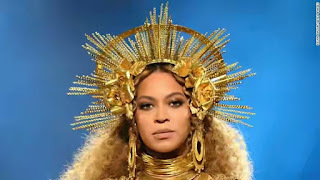 While she performed at the Grammys to rave reviews, she postponed plans to headline the Coachella Music Festival until 2018.